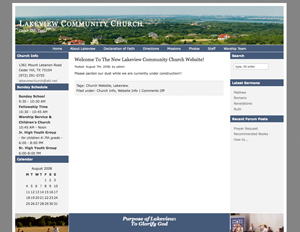 Just less than a week since I started working on the Lakeview church website, things are moving along rather nicely. I’ve pretty much been given full control over design over the whole project, which is nice. I’m sure there will be plenty of suggestions on how to make it great and that will be nice. Hopefully there won’t be too many crazy requests or suggestions, though they do seem pretty set on having some sort of Flash element to it. And honestly, that just won’t happen. I don’t have the time for it but I do have some tricks up my sleeve that look Flash-like here so it should please whoever seems to want that kind of thing on the site. I keep moving things around here and there on it so if you give it a look it may change from the next time you take a glance at it. I’m still waiting on content as well, but that’s just part of the game when you build a website for someone like a church. The waiting game of content. I will try to keep you all posted on how that is coming along here.